Sonoma County covers a lot of territory, from the Pacific coast to the edge of Napa and stretching from the Carneros region at the top of San Francisco Bay all the way up to Cloverdale in the north. It's too big and diverse to attempt to see it all during one short visit, so we've divided it into parts. This getaway guide focuses on "Sonoma Valley," the area around the town of Sonoma, which includes Glen Ellen and Kenwood. Sonoma is less crowded than Napa Valley, with the wineries more spread out, friendlier and on the whole, less pretentious. The Sonoma countryside doesn't have the well-defined "valley" feel you'll get in the county next door, but that doesn't mean it lacks beautiful scenery. Pinot Noir, Zinfandel, and Merlot grapes grow well in the Sonoma Valley, and Sonoma Chardonnays are often more complex than those grown in Napa. In Sonoma Valley, you can taste more than just wine. Olive oil, artisan cheese, and local produce are sold in many spots, and they make great souvenirs. Sonoma weather is pleasant most of the year, but in summer it can be more crowded and hot. One of the most popular times to visit is fall, during the harvest, but that's when winemakers are busiest and have the least time for their visitors. If you've only got a day, spend it in downtown Sonoma. It's just right for a rambling browse, with shops and restaurants surrounding a shady town square full of inviting benches. Almost every building has a historic plaque out front and most are dated before 1900. You'll find a few wine tasting spots here, so you don't miss a thing. 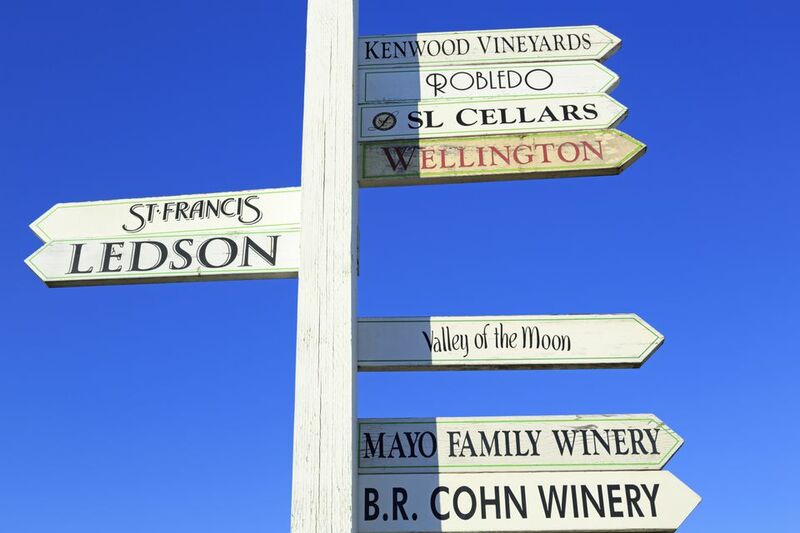 Towns in the area of Sonoma Valley include Kenwood, Glen Ellen, and the town of Sonoma. On some websites (and especially at TripAdvisor), you may need to search for each town separately. If you're staying in Sonoma, lodging on the town square or within walking distance of it will be the most convenient. However, other places a bit further away may offer enough extras to be worth it. Sonoma Valley is busiest during summer vacation season (late May to early September) and also during the grape harvest which can start as early as the end of August and run into October. Bed and breakfast inns can be harder to find without spending countless hours going through their websites. Sonoma Valley Vacation Rentals - Rent a big house and invite a bunch of friends to join you. Sonoma is 45 miles from San Francisco, 92 miles from San Jose, 68 from Sacramento, and 200 miles from Reno, Nevada.